Vibranium is a material that resists kinetic energy and also can vibrate through to bring ruin to other materials. This allows the tech to be used in ways that are virtually magical, capable deflecting and cutting through just about anything. We haven't seen technology like that for a long, long time, practically from a galaxy far away. With tech like that, it is important that the engineers making the stuff are very careful in what they decide to create and how it will be used. That's why we're super excited to introduce what our design team has just crafted. Officially licensed and exclusive, these Black Panther Cosplay Fingernail Tip Rings are the newest in real-world Wakandan technology. 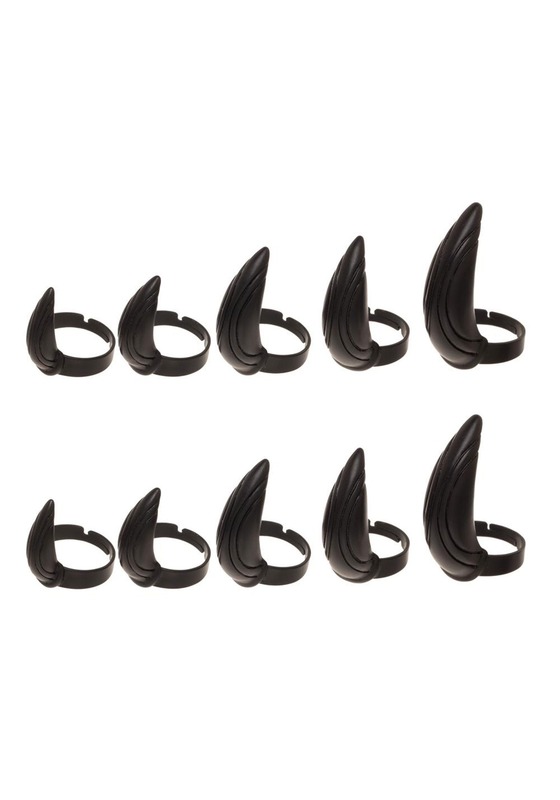 These adjustable rings fit at your front knuckle and instantly grant you the mighty claws of the Black Panther. Each measures between 1 and 2 inches and turn any regular glove into a Panther claw! When you are wielding the might of the Black Panther in both (or even in one) of your hands, be sure that you are aware of the power that you hold. Vibranium can treat flesh and even metal like butter and these Black Panther Fingernail Rings could... you know... kinda sting if you scratch someone!